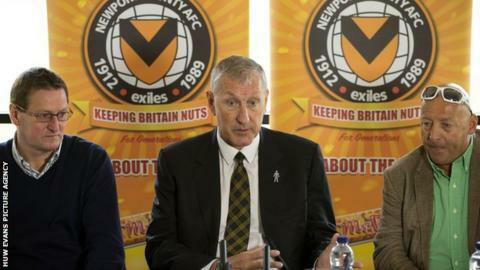 Newport County's takeover by the Supporters Trust moved a step closer on Monday after ex-chairman Les Scadding agreed to transfer his shareholding. The Trust will now seek approval from the Football League, with the current board set to step down once the change of ownership is completed. Director and acting chairman Howard Greenhaf confirmed the news. "The Supporters Trust has agreed to take over the running of the football club," he said in a statement. Greenhaf added: "The current board will work alongside the trust during this period of transition, before stepping down. "Newport County will then become owned entirely by the fans/supporters. We all believe that this is the best way forward and will secure the long-term future of the club." The Trust has been helped by the legal team of national fans' body Supporters Direct, which had been examining Newport's finances ahead of the proposed takeover. EuroMillions winner Scadding stepped down as chairman of the League Two club in June 2015. Scadding invested £1.25m into Newport, helping them win promotion back to the Football League in 2013. The 59-year-old's departure from Newport, who narrowly missed out on a League Two play-off place last season, means the club have reduced their playing budget from around £1.4m to an estimated £850,000 for this season. Ten first-team players have left Rodney Parade since the end of last season and new manager Terry Butcher, who took charge in April following Justin Edinburgh's departure to Gillingham in February, has started to rebuild the County squad. "We were forced to set a reduced playing budget for the coming season," Greenhaf said. "Our new manager was aware of the budget prior to agreeing to join the club and has assembled a squad that we believe will be competitive in this league and to meet the aspirations of our loyal and passionate supporters. "We want to be more than just competitive, so with the help and support of the fans through the Supporters Trust, we believe we can raise enough money to provide Terry with an increased playing budget and push the club forward and hopefully into the play-off positions."